If you follow my blog, you know Nathan and I enjoy eating at different restaurants. Sometimes we plan out places to go, other time it is left up to chance. Last night we knew we wanted to go eat some where out of the valley. 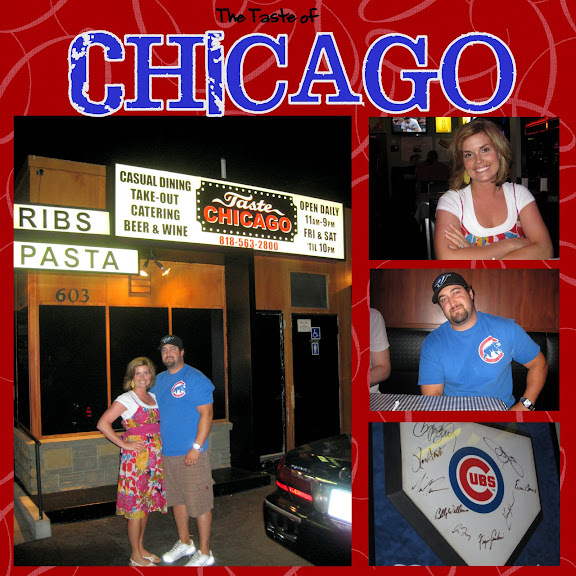 As we got close to Burbank, Nathan suggested a place called Taste of Chicago. He had stopped there once during work and liked it. The restaurant is a small building but serves a lot of food. The food was good. They serve a lot of Italian food. They also serve Chicago style hotdogs and pizza. We got the pizza and a Italian dip sandwich with a side of penne and cheese (their style of mac-n-cheese). The funny thing is Nathan was wearing his Cubs shirt, which is Chicago's baseball team. The Angels v. Yankees game was on so Nathan enjoyed that. 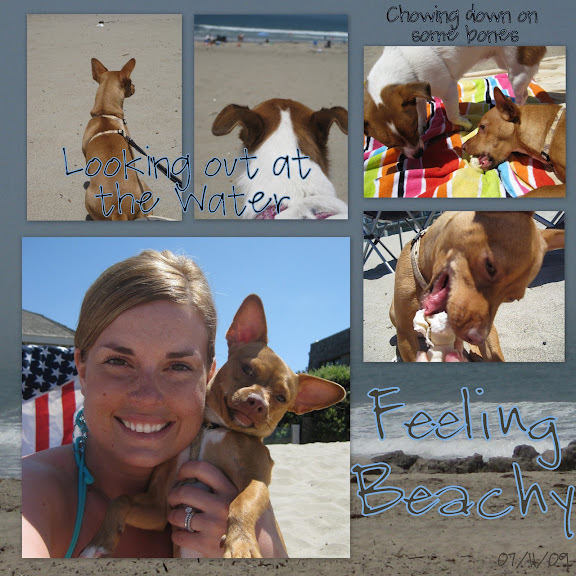 Today we enjoyed another beautiful day at the beach. We brought the girls and went to Ventura again. The sky was blue and the breeze was warm. We relaxed and the girls chewed on bones. I was able to finally catch on camera something that Sarah does that cracks me up. Wherever I give them bones, Sarah's animal instincts kick in and she wants to bury her bone. Usually we are at home so she tries to bury her bone in the sofa cushions and pillows; sometime she even tries digging into our legs to bury it. At the beach today, she yet again wanted to bury her bone. First, she tried the sand, but as she dug and dug the dry sand just slid down into her hole. Finally, she stuck the bone into it and covered it up. But she was dissatisfied and dug it up to find another place. In the video below, you will see that she is trying to bury the bone on top of the sheet. It is hard to see the bone, but you can see her pushing my dress with her nose as if it is dirt to cover up the bone. She cracks me up! why do you have such quirky dogs? Who does she think is going to take the bone? Yeah, she is funny! I don't know what she is thinking! Peppy would bury her bones all over the yard.